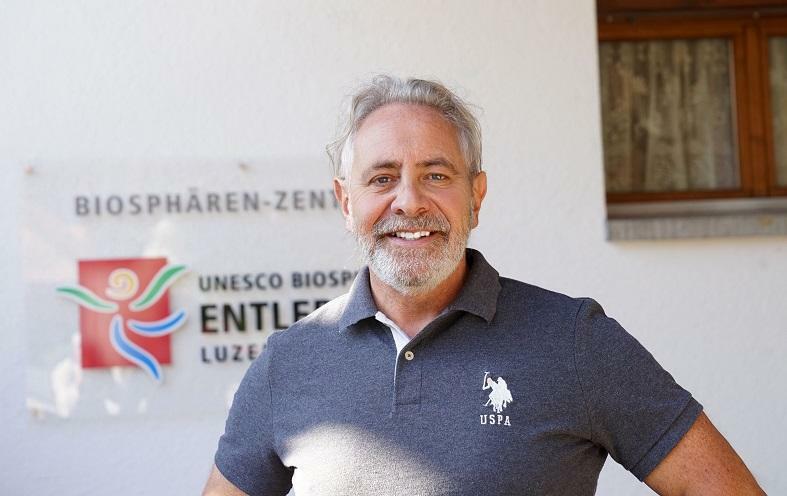 Theo Schnider, director of UNESCO Biosphere Entlebuch, a mountain destination near Lucerne in Switzerland, in this interwiew shares his experience of developing, managing and promoting a nature-based destination. His use of humour in how Entlebuch presents itself is a timely reminder not to take ourselves too seriously, and to focus on opportunities and creative problem-solving in tourism, rather than merely trying to “manage” challenges such as climate change. Our interview with Theo is part of a special series of interviews with Swiss sustainable tourism leaders and changemakers. Theo, do you remember the first time you heard about sustainability in connection with tourism? What (or who!) got you interested in the topic? Of course, during a lecture by Professor Jost Krippendorf of the University of Berne. That was in 1981. Jost Krippendorf was ahead of our time and set important trends in regard to responsible tourism. How has your view on tourism and sustainability changed, as Director of the UNESCO Biosphere Destination Entlebuch in Switzerland? I dealt with the topic of sustainability much earlier, when I was still director of the holiday region Sörenberg Central Switzerland. We were the first region in Switzerland to offer professional excursions that combined the themes of business, society and environment, and were also the first destination in Switzerland to introduce sustainability to schools. Later, as director of UNESCO Biosphere Entlebuch, “sustainability” became my actual core business. Why did Entlebuch decide to become a UNESCO Biosphere Destination? In 1987, by accepting the “Rothenthurm-Initiative” for the protection of our moors, large parts of Switzerland – and 50% of our region – were placed under protection. With a share of about 66%, tourism dominates the economic profile of Flühli-Sörenberg. The touristic development of the region was, in view of the now protected areas, without prospects. All we could do was to try to turn the perceived handicap into advantages and benefits. So we tried to highlight and explain the values of the natural resources of moors, as well as of Karst-Regions. In practice, we had to create awareness and an understanding among the residents affected by the decision. After an intensive development phase, the Entlebuchian voters agreed to establish a UNESCO biosphere in 2000. Entlebuch is worldwide the first biosphere reserve that has been established based on a democratic process and a popular referendum, with a fantastic 94% of YES votes. Today we are recognised by UNESCO as a model region for sustainable living, responsible business and nature protection. Countless biosphere reserves and governments from all over the world are visiting us to learn from our approach and to profit from our achievements. Entlebuch has become a brand. Switzerland’s innovative – often quirky, humorous – destination promotion campaigns have earned it much admiration internationally. Do you have examples of how marketing tools can be used to encourage responsible travel and contribute to the sustainability of destinations such as Entlebuch? There are countless examples and many more ideas. One UNESCO Entlebuch Biosphere campaign that attracted attention beyond the borders of Switzerland was that of advertising for extra-terrestrial guests. The film was shown at the Cannes Film Festival and the idea was promoted to about 80 million people throughout Europe, by German media. The UNESCO Entlebuch Biosphere shows in a very impressive way how the topic of sustainability can be communicated with humour and creativity. Most destinations feel the consequences of climate change in one way or another. How is Entlebuch affected, and how do you adapt? The ONLY chance is to adapt to climate change. For example, more focus on summer activities in the Alps. Less complaining, more proactive looking for solutions and opportunities. You can’t think negatively and expect positive things at the same time. These are challenges that can also be fun. We have to design, instead of just managing; communicate, sensitise and improve. Successful destination marketing used to be mostly about innovative, engaging campaigns and smart pricing. Yet, in times of tourism fatigue and digital societies, it is more and more about brand stewardship and active networking internally, ensuring close links to the local “host” communities. In your view, are DMOs prepared for this paradigm shift – ready to take on a role of facilitator and brand/destination manager, rather than “just” promoter? It’s not a paradigm shift. Strategies, tools and priorities change all the time. Above all, tourism must become more human again. That is why promoters and hosts continue to be key features. A host who is open to the concerns, wishes and worries of the guests knows where the shoe pinches. More important than any brilliant infrastructure and any isolated range of services is the customer dimension. If you do not enjoy the service culture, you cannot find fulfilment in serving and surprising guests in this highly emotional business. How important is a destination’s sustainability performance nowadays for its commercial competitiveness? The word sustainability is of little “value” to tourists. On the contrary, sustainability is often dissuasive, tedious and unattractive. Living sustainably means being open to change. Most people are afraid of change. We have to keep on looking for different, more interesting and attractive approaches to sustainability: to make it fun. This means practical examples. Sustainability must be discovered, experienced, and enjoyed. Anyone who discovers sustainability will naturally take on this idea. Sustainability means enjoying each other’s success. If your partner’s okay, you’re okay too. Sustainability cannot be prescribed. It is an attitude, a personal view of life, full of responsibility and respect towards others and the next generation. Sustainable development means learning together, which requires a culture of respect, openness, cooperation, as well as personal initiative. We often take ourselves too seriously on this planet. Your main insights – lessons learned – from developing the Entlebuch destination brand? The development of a sustainable model region takes a long time, a lot of instinct to navigate the processes of change, and a lot of perseverance. Unfortunately, well-known miseries are often more popular than little-known opportunities. What would you say makes the Entlebuch approach unique, compared to other destinations and their sustainable development efforts? We have developed a sophisticated cooperation model. It is the base for a participative process. Participation is an absolute prerequisite for implementing sustainability processes. Regional development begins in the mind. We must all work towards the common goal and talk about it continuously. We, humans, have more than sufficient knowledge to solve problems, but we do not communicate and cooperate with each other well enough. Today Entlebuch has become a reputable brand in terms of regional development and sustainability. People are the real capital, with their ideas and their commitment on the ground. Which advice can you share with destination marketers in terms of how to approach sustainability? Concentrate on your strengths, your roots, your competence and look for your development potential. That’s the only way to become irreplaceable. Identity and a culture of cooperation and togetherness are important components of destination success. Biosphere reserves are a great facilitator for promoting sustainability internally and externally. Ecological, social and economic interests should be given equal weight and rights, in order to promote sustainable development. There is no more efficient way of establishing sustainability. But it can only succeed with the commitment of the local population. Pressure from above (science, politics, government, associations and interest groups etc.) does not implant the spirit of sustainability in the minds of the population. Planned economy and bureaucracy that are controlled by outsiders are innovation killers. However, we cannot make all regions equally competitive and turn every economically depressed region into a park or a model region of sustainability. These are the dreams of scientists and politicians who are unaware of how diverse and complex destinations are in practice. More about the UNESCO Biosphere Entlebuch here. Connect with Theo Schnider on LinkedIn. Our interview with Theo Schnider is part of a special series with sustainable tourism leaders and changemakers in Switzerland, supported by Swiss Youth Hostels, Swiss Travel System and SWISS. Enjoyed our interview with Theo Schnider, Director of the UNESCO Biosphere Entlebuch near Lucerne in Switzerland? Spread the word!